Peanuts can be processed into many kinds of delicious food, also can squeezed to produce the essential cooking oil for people. You may not know that peanut sieving machine is an indispensable mechanical in peanuts processing. 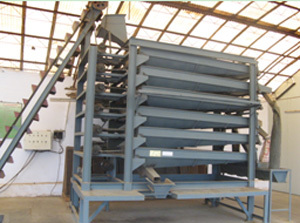 The peanut kernels will be better for the next processing procedure, peanut after sieving also helps for peanut processing machinery maintenance. Peanut screenig machine is with compact structure, reliable operation, can save time and strength by using the whole screening convenient operation, in order to meet up customer classification standard only after a screening, peanut kernels can be divided into four to five classes. Charging spout, first hoisting machine, removing stone machine, blower fan, second hoisting machine, receiving device make up peanut grader machine, it is an assembly line that used to remove the stones from the peanut kernels. it produces peanuts meet the imported peanut products inspection standard by compact structure, easy installation, low noise, energy saving and clear classification. According to materials of different particle size, peanut kernel screening machine achieves screening, filter, classification, the whole grain effect. Feed peanut kernels into hopper quantitative continuously and evenly whrn normal working, peanut shells is broken in the rotor strike repeatedly against, friction, collision. Peanut kernels and broken peanut shells through the aperture screen under the rotor rotating wind pressure and blow, first with the big hole screen, after the screening the small fruit change the small holes on the second screen shell, at this time, peanut shells and the grain under the force of rotary fan blowing, peanut shells of light weight are blown out the machine, peanut kernels through the shaking sieve to clear the purpose of screening. Place the peanut sieving machine for peanut kernels on level ground, check whether the fastener is tighten, and rotating parts is flexible or not, each bearing must within lubricating oil before using. Before using, check the power supply, the switching must be in a disconnected position. When motor is started, the direction of the rotor and machine should be consisted. Before evenly feeding peanuts, idling for a few minutes to observe whether there is abnormal noise to ensure it functions normally. Before open the discharging mouth, feed peanuts blanched, evenly, with right amount until peanuts cover the sieve. Moisture content of peanuts should be proper, broken rate is high if too dry, the work efficiency will be influenced if too wet. According to peanuts size to chose appropriate screen. If peanut shells accumulate, we can move down the motor, so as to tighten fan belt, increase blow air volume. After a period of using when trying to deposit machine, we should eliminate the dust clean the dirt and internal residual grain waits sundry. The peanut sieving machine should be placed in dry storeroom, avoid weathered and keep the belt separately. Use diesel to clean each bearing, buttered them after dry, should keep the transmission parts and bearing chamber with plenty of lubricating oil and clean and change them regularly. Next article will introduce groundnut machine .